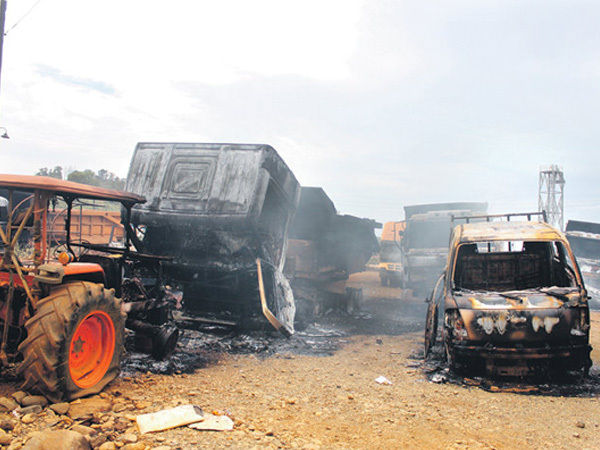 Mining equipments burnt by communist guerrillas in Surigao del Norte. 1. After the devastating hit by typhoon Pedring in Northern areas of Luzon New People's Army (NPA) hit three mining firms in Surigao del Norte. So far this is the largest staged by the communist rebels in Aquino administration. For one reason, the government is spending too much time and attention to natural calamity victims. 2. The government has said it hopes to sign a peace deal with the communists by the middle of next year, few observers believe an agreement is possible. As always expected the most have its negative views - to the president and his administration. 3. Within the year peace talks broke down, it is amidst familiar demands by the government for the NPA to stop its extortion activities and calls by the communists to free jailed comrades. Soon to be expected is ANTI PEACE TALKS BILL. 4. According to Presidential spokesperson Edwin Lacierda, the government is very clear to remain committed to pursuing peace with the NPA - take note not with GMA.